One of two, each comprising: a coffee-pot, a cream-jug, a sugar-bowl with spoon and a stand, each piece spiral-fluted and with a central waist, the coffee-pots with angular loop handle, one with antique ivory and one with nylon insulators and finial, the cream-jug and sugar-bowl each with flying scroll handle, the stand with fluted border, the spoon and stand each engraved with the Royal coat-of-arms. Charlotte and Peter Fiell, Robert Welch Design: Craft and Industry, London, 2015, p. 171. Robert Welch was born in Hereford and studied metalwork at the Malvern School of Art and later silversmithing under C. J. Shiner and R. Baxendale at Birmingham College of Art. In 1952 the year following the festival we entered the Royal College of Art, a year below David Mellor and Gerald Benney. As part of his studies he also made at least four trips to Scandinavia which must have helped establish his design ethos. Having initially undertaken design work for the firm of J. and J. Wiggins he went on to establish his own workshop in 1955 in Chipping Campden. It is fitting that his premises were in a silk mill that had once been the home to Charles Robert Ashbee’s Guild of Handicraft which had been so influential in the design and production of silver earlier in the century, a tradition that Robert would continue. During his career he was recognised many times for this contributions, being elected a Royal Designer for Industry in 1965 and being awarded an MBE in 1979. 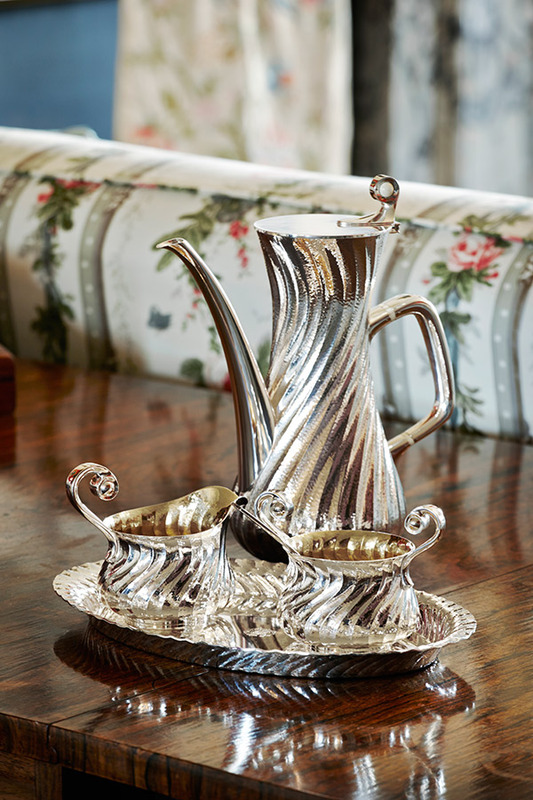 Besides the collection of the Silver Trust his work in silver can be seen in collections throughout the world, including the Goldsmiths’ Company in London, the British Ambassador’s residence in Manila, the Victoria and Albert Museum and the British Museum. You are here: Home / Silversmiths / Robert Welch, M.B.E., R.D.I.